Hope you all had a fantastic Easter! If you don’t celebrate Easter, I hope you had a wonderful weekend. I don’t know about you but the weather was absolutely gorgeous here in the south during the weekend. Most of my plants recovered from the freak cold snap we had earlier in the week though I may need to replant my cucumbers. Most of you may have noticed that more and more people are wearing neon and accessorizing with these colors. I’ve seen bright tops, skinny jeans, sundresses and shoes, just to name a few. You know I’m not one to run out and purchase the trendiest clothes or spend a fortune on fashion. I am more practical than fashionable. Even though I am not a “fashionista,” I do keep an eye out on the latest trends and I have to admit, I am really enjoying the neon fad. I dropped it as I was getting out of the car to go in to work. It fell flat on the ground face down and when I picked it up, my heart sank. It was a moment of pure shock and it took my breath away. The screen was broken and the touch screen was no longer functional. That same day I went ahead and ordered the replacement part for the phone and ordered a new phone: the Nexus 5 and a bumper case. 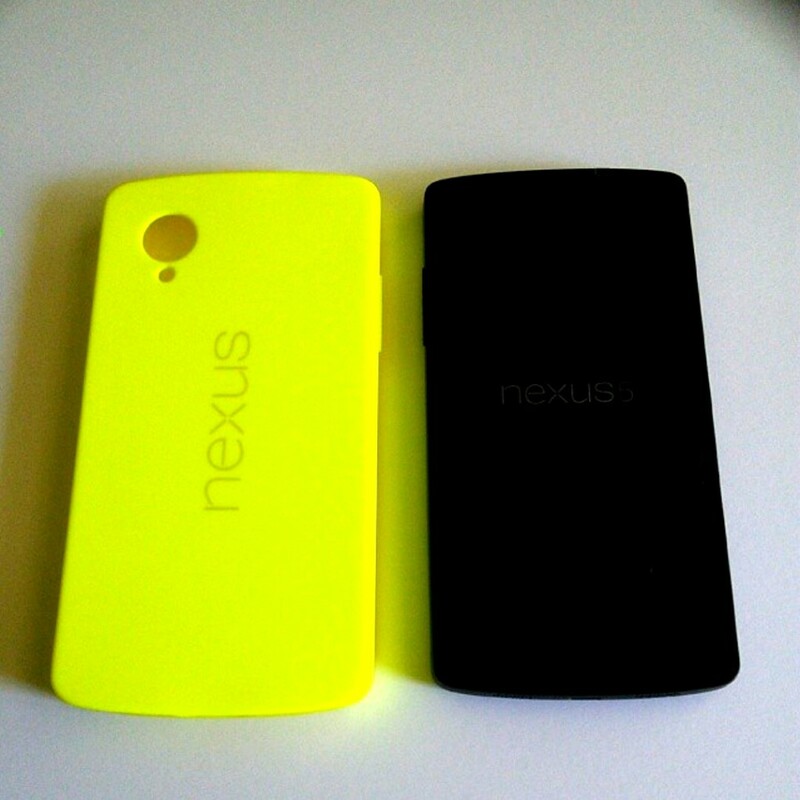 Thanks to Google/Nexus/LG’s efficiency, I got my new phone in just two days! I am a huge Google fan and their great service has made me like them even more. As with the Nexus 4, the replacement part came in and thanks to YouTube, the screen was replaced. I just love technology 🙂 My mom has always adored my Nexus 4 for so I decided to give it to her (she was in desperate need of a smartphone). Everything worked out. 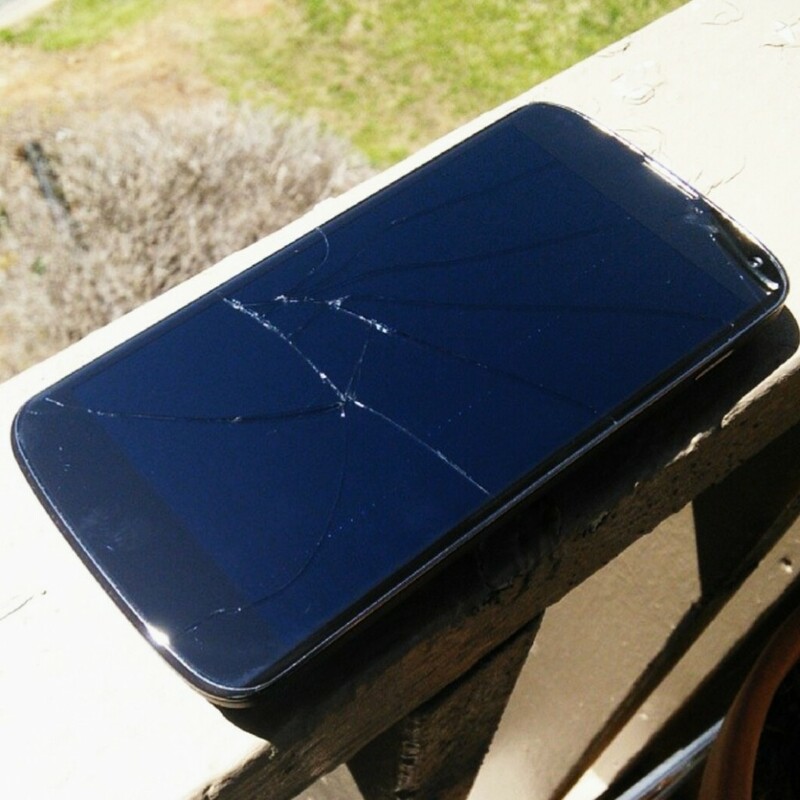 Unfortunately, the events following the phone disaster did not turn out so well. After the phone situation, I ran into some bad luck with Massage Envy, Wells Fargo and Best Buy. I am not going into details, but I am going to say that they have lost a once very loyal customer. I just love how horrible things happen all at once (if only you could hear the sarcasm). This week is a start of a new week and I am keeping my chin up and I am marching forward! So, moving on to something more fun. 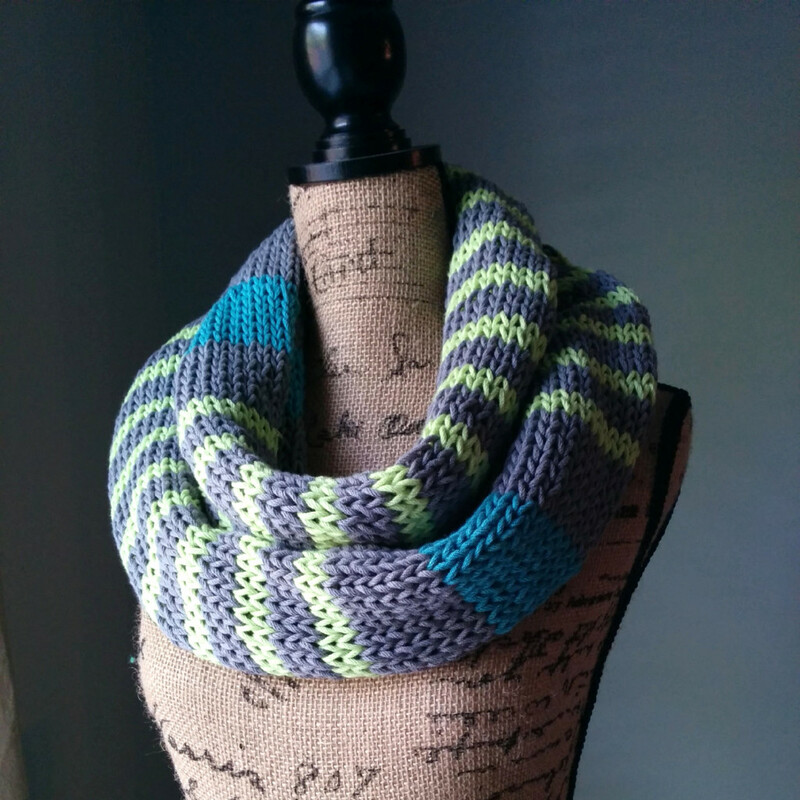 This past weekend I finally finished the Neon Stripes Infinity Scarf. I am very excited to share this pattern with you all. After completing the Spring Lace Infinity Scarf, I wanted to knit something simpler. The scarf is knitted in stockinette stitch and in the round. By knitting the scarf into a tube and later joining the ends, this makes it reversible. 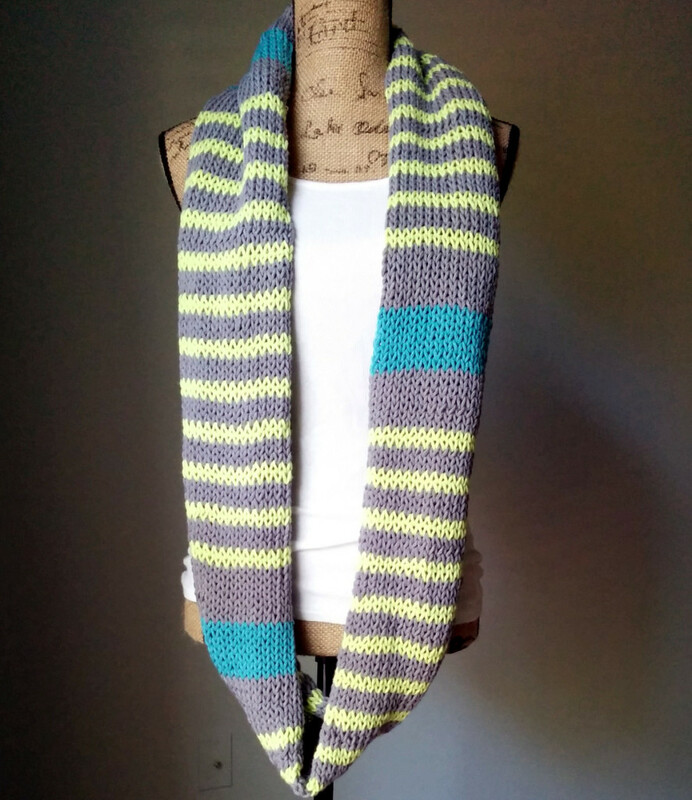 Also, going back to the neon discussion from earlier, I made this scarf gray with neon green/yellow and blue stripes. 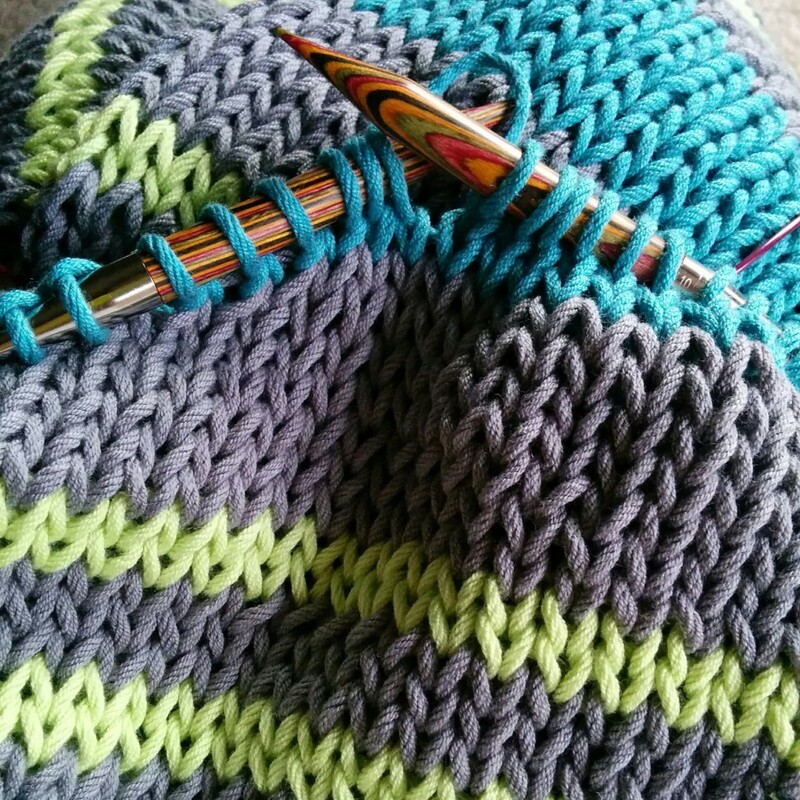 If you’ve never knitted stripes before, here is you chance to do so. Along with the pattern I’ve included some helpful tutorials on how to switch colors and also how to knit jogless stripes. With this scarf, I used Berroco’s Weekend Chunky in Camp Stove, Taffy and Cottage. This yarn is a cotton/acrylic blend which makes it perfect for cool Spring mornings and evenings. Whether you are headed to a yoga class or running errands, just throw on the Neon Stripes Infinity Scarf and you are good to go! Note: this is a chunky scarf. This scarf measures approx. 71″(180 cm) circumference and 7″ (18 cm) wide. US 15 16″ circular needles (I used 32″ circulars and used the magic loop method). CO 40 sts. Place stitch marker and begin to knit in the round. Careful not to twist stitches. Knit all rounds. Follow diagram below (by Rows I meant Rounds). 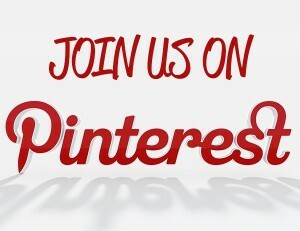 Here is a great video on how to carry yarn over to prevent a ton of loose ends. Once you’ve reached the desired length, bind-off. Then using the Camp Stove yarn (about four feet), use this tutorial to knit the seams together. Make sure you line up the scarf correctly. 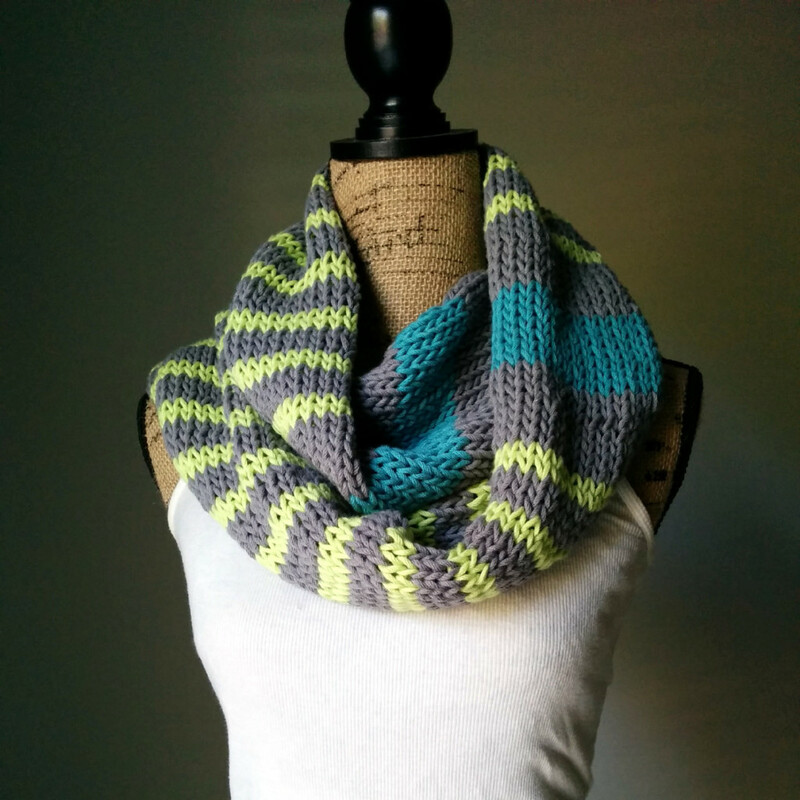 Now you’ve completed the Neon Stripes Infinity Scarf! Happy knitting! How do you like working with the Knit Picks Interchangeable needles?? I’m trying to decide between the wood and the nickel plated. Thanks! I LOVE the wooden Knit Picks interchangeable needles! I have used both and I prefer the wooden ones. I love how the wooden needles don’t get cold the way the nickel plated ones do but that’s a personal preference. Hi! I love your pattern and am adapting it for a scarf for my boyfriend. I’m using a DK yarn and was just wondering if you could post the length of the stripes? i.e. is the blue stripe 2 inches? How about the small green stripes? Thanks Kris. The blue stripes and thick gray stripes measure about 2″; the neon green/yellow stripes are .5″; the thin gray are about 1″. Thank you! That’s a great help! I have an Etsy shop and have a scarf patternt that I made, but wanted to use the color idea you have here (it’s a differnt pattern for construction entirely) and was wondering if you would be okay with that? I decided to take up knitting while on crutches this summer and this was my very first project. Thanks to your fantastic mentorship, it turned out beautifully!!! THANK YOU, THANK YOU, THANK YOU! I’ve knitted five other projects since this one and am totally hooked! I really can’t thank you enough for the inspiration. I want to knit this for my sister for Christmas, can I knit with straight needles? I have a set of 15 straight but not round. Do you just prefer to knit in the round or is it essential for this pattern? The reason for knitting this in the round is that it makes the scarf reversible by creating a tube. You don’t have to knit it this way. You can knit it flat and then sew the ends together. This will make it into an infinity scarf but not reversible. If you want to make it reversible but do not want to knit it in the round, you can knit it flat then sew it together lengthwise to create a tube. Then you can sew the ends of the tube to make it an infinity scarf. I am very new to knitting and this was my first project that I completed. I made it as a Christmas gift for another Harry Potter fan in Slytherin colors using green, silver, and black and I love how it turned out! I’m now on the hunt for colors to make one for myself. Thank you for such a wonderful pattern!